Back in March, a group of Pittsburgh bloggers organized a March Madness bracket challenge – we all agreed that each blog would write a post about the winning bloggers favorite nonprofit organization. Kate Stoltzfus (aka the brains behind the blog Yinzpiration) had the winning bracket and her nonprofit of choice is PULSE. I am more than happy to write about PULSE as I think this is one nonprofit that has been quietly making a big impact on some Pittsburgh neighborhoods and is well positioned to continue to do more for the city. PULSE stands for Pittsburgh Urban Leadership Service Experience. Each year PULSE takes a group of college graduates, gives them a place to live and matches each person with a Pittsburgh nonprofit. To provide housing for the participatns, PULSE has been rehabbing and improving homes in different Pittsburgh neighborhoods. COMMUNITY LIVING – Cultivate community by having participants live together and share meals, household tasks, finances and learning experiences. TRAINING/DEVELOPMENT – Train and equip participants to become servant leaders in Pittsburgh by providing regular, personal and professional development opportunities. I’ve learned more about PULSE because some of my favorite Pittsburgh things have a link to PULSE. The Union Project – yep, that was the idea of some of the PULSE participants. Have you checked out Kate’s blog Yinzpiration? Kate came to Pittsburgh to participate in PULSE, now she writes great interviews with Pittsburghers at Yinzpiration and she is one of the founders of Propelle. You can read some of the other PULSE alumni stories here. If you would like to learn more about PULSE or support the PULSE programming you are in luck. This Friday, April 12, 2013 is their annual fundraiser PULSEations which will be held at the Union Project from 7-10pm. I have been wanting to share the invite to PULSEations – I kind of wish this could be the logo for IheartPGH, city skyline. More info about the auction is available here. I will be there and I would love to see you there too! 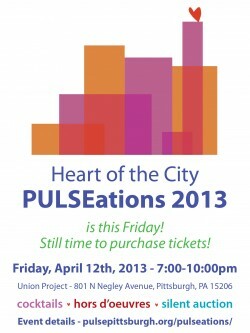 Whew… Just ordered tickets for @pulsepittsburgh #PULSEations this Friday! Looking forward to seeing so many great people in one room! @iheartpgh @pulsepittsburgh is what made me fall in love with the city, meet great people, and stay here almost 4 yrs! @iheartpgh @pulsepittsburgh Proud sponsor of Friday’s #PULSEations @ Union Project; looking forward to local ales and cool silent auction.
.@iheartpgh @pulsepittsburgh participants have given over 250K hours of service to Pittsburgh! Many cool Burghers came here through PULSE.